Different ‘Sheets’ in Google Spreadsheet? 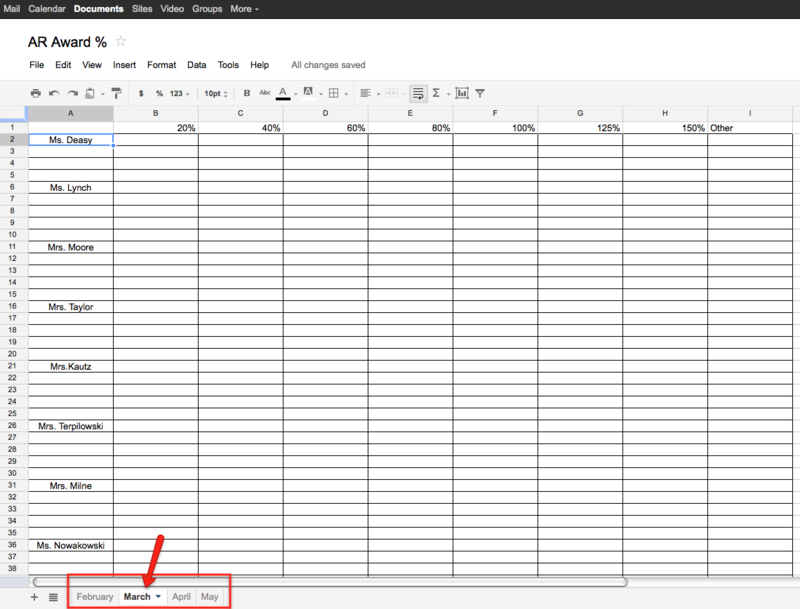 Yes, it is possible to to create several pages or ‘sheets’ in Google Spreadsheets. Many people avoid spreadsheets due to their complexities. However, they don’t have to be difficult. This is an example of a spreadsheet my site uses to keep track of AR goals. You are seeing a view of March. Simply click on the desired month and enter the data (student names in this case). The ‘Sheets’ were easy to create. By simply creating the desired format (or template) you are then able to copy that to another sheet. For this example, I clicked the small arrow next to March. I then clicked Duplicate. The next sheet was created as ‘Copy of March’. 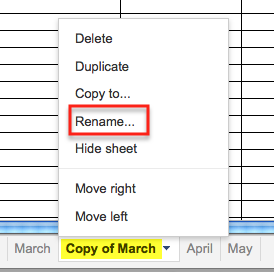 On ‘Copy of March’ I again clicked the arrow and chose Rename… I can then Rename it ‘June’ then ‘Move right’ to place the sheet in the desired location. 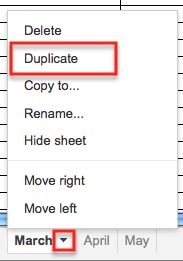 This entry was posted in How To and tagged Duplicate Sheets, Move Sheets, Rename Sheets, Sheets, Spreadsheets by Admin. Bookmark the permalink.